From GabelliConnect on March 15, 2017. When you think of Miami, what comes to mind? Palm trees, sunshine, and the ocean? 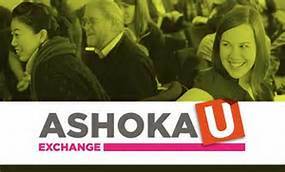 At this month’s three-day AshokaU Exchange conference, 13 Fordham representatives gathered in Miami for a different kind of experience. The exchange brought together 750 students, faculty, staff, and alumni from around the world to develop leadership skills, learn about program implementation, and work to advance social innovation in higher education. One of the most inspiring aspects of the Ashoka conference, said Max Lynch, BS ’19, was the ability to share strategies with people from different schools. Whether discussing ideas over breakfast with representatives from Queensland University in Australia or hearing from students at the University of San Diego, the sense of collaboration was ever-present. Looking to the future, Lynch is hoping to bring some of the new ideas he learned about at the conference back to Fordham, such as starting an innovation week.